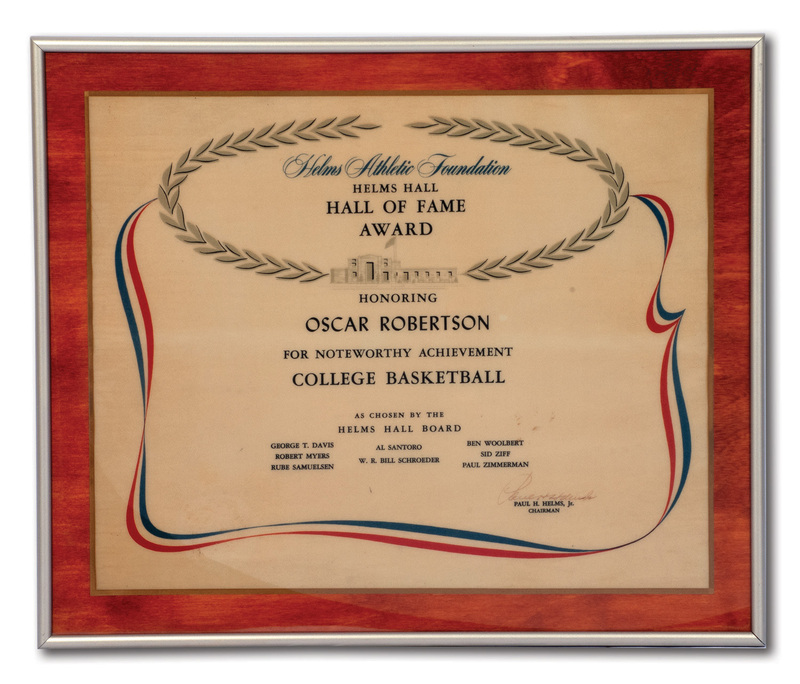 Featured here from the Oscar Robertson Collection is his Helms Hall of Fame Award. The lovely certificate measures 15" by 18" and comes on a laminated wooden display board around 1/2" thick, honoring "Oscar Robertson For Noteworthy Achievement College Basketball." The bottom lists the eight esteemed Helms Hall Board members along with the laminated signature of Chairman Paul H. Helms Jr. (co-founder's son). Founded in 1936, the Helms Athletic Foundation initiated the first recognized athletic Hall of Fame, a precursor to the National Baseball Hall of Fame which had its first induction ceremony in 1939. The award comes in outstanding condition and is nicely framed as "The Big O" had it mounted on his wall for decades. Includes LOA from Oscar Robertson.